Club President Angela Greiling Keane interviews former Federal Reserve Chairman Alan Greenspan. Former Federal Reserve Chairman Alan Greenspan told a National Press Club Book Rap Nov 6 that his new book, "The Map and the Territory: Risk, Human Nature, and the Future of Forecasting," is a detective story. Greenspan said that he wanted to discover “step-by-step” how the crisis happened. He started out by believing human rationality would prevail. He began his examination by asking whether this was true. Everyone knew that there was a housing bubble, Greenspan said, but no one knew the bubble would burst on Sept. 15, 2008. The bubble in the housing market caused the financial collapse because it affected the financial markets as compared to earlier bubbles that just affected the stock market, Greenspan said. The markets closed down for the first time in more than a century, he said. The much-derided Troubled Asset Relief Program or TARP wasn’t a disaster, Greenspan said, but the uncertainty caused by continued government intervention is the reason the economy is growing more slowly than people want. This uncertainty leads Greenspan to believe in a cloudy future. Greenspan is pessimistic about the future because the economic uncertainty is exasperated by the dysfunctional political system where too many policy issues are “uncompromiseable,” Greenspan said. In order to get the economic house in order, the budget needs to be more balanced, which will require either significant spending cuts or raising revenues. Both ideas are not politically popular, Greenspan said. Greenspan complimented the press corps, saying “Those in the press corps that strived to be objective without bias” did 'an extraordinarily good job' covering the financial crisis of the last five years." 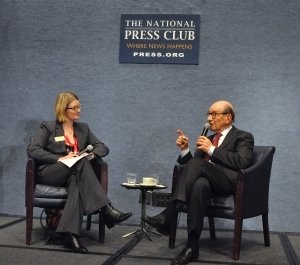 NPC President Angela Greiling Keane interviewed Greenspan about his new book. The event was a fundraiser for the National Journalism Institute sponsored by the Club's Book and Author Committee.